In a compelling conversation at the HCLI’s Asian Human Capital & Leadership Symposium 2018 in Singapore, Sara Cheng, CEO, Fuji Xerox Singapore, Dato Hamidah Naziadin, Group Chief People Officer, CIMB Bank, and Desmond Kuek, Founder Genium & Co, discuss the changing business landscape in the climate of digital transformation. Human Capital is defined as “the measure of skills, education capacity, and attributes of labor that determine their productive capacity and earning potential”. It is, therefore, a measure of potential that in turn affects economy and sustainability. But how are organizations rethinking and transforming their human capital strategies in the climate of digital transformation? Here, we take a look at how a few organizations are doing things differently. The Malaysian banking group, CIMB, is the fifth largest banking group with over 37,000 staff in 15 countries across ASEAN and beyond. Dato Hamidah Naziadin, Group Chief People Officer, CIMB Bank shares that “In today’s context, competition is not about banks anymore; our competitors are coming from outside of the banking industry today.” That is the case both in terms of business and talent which means that organizations need to look at ways of working differently. The bank has also transformed how they look at recruitment and onboarding: “CIMB looks at cognitive skills, especially when it wants to recruit fresh talent and assess if they can navigate complexity.” CIMB has redesigned their new joinee program and from having mostly banking functional focus, the bank has now introduced rotations in startups and diverse projects that allow graduate hires to expand their mindsets. Redefining employer-employee relations: Genium & Co.
“With increasing automation at the workplace, leaders need to manage sentiments, anxieties, aspirations, and needs as they continue,” shares Desmond Kuek, Founder Genium & Co. Additionally, leaders need to navigate through the generational divide that is increasingly creating more tension in collaboration and teamwork. Kuek suggests that organizations need to look at going beyond the silo structures and think “networks.” By breaking the boundaries of structures, people can take ownership of building their networks to get the work done. 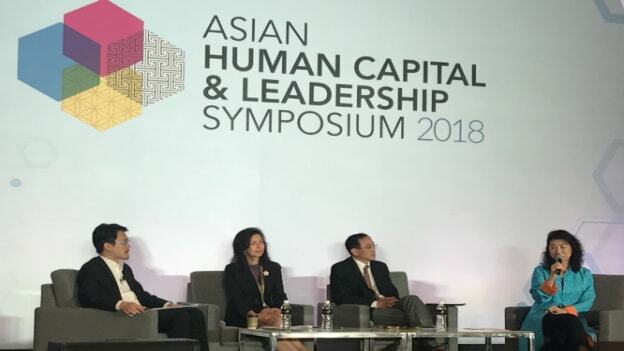 Excerpts from the panel discussion at HCLI’s Asian Human Capital & Leadership Symposium 2018 in Singapore.